China and India are the two most populous countries in the world and now also two of the fastest growing. By sheer virtue of the fact that China and India are home to 2.4 billion people - two-fifths of the world's population - the rapid growth of their economies has far-reaching implications not just for global living standards and poverty reduction but also for competitiveness and distribution of income in the rest of the world. Commensurate with their economic progress, there has been a surge of interest in the nature and implications of China and India's economic growth. There are several apparent similarities in the development process of China and India: both are home to ancient civilizations that have bequeathed distinctive attitudes, institutions, and traditions. Both have very large populations. Both have performed well economically for more than two decades. However there are important differences that can be seen beneath the surface. China started the current reform process in 1978 - that is, almost fifteen years before India. The two countries have very different political systems. Their development models differ fundamentally as well. China has opened up much more than India to foreign trade and foreign direct investment, while India has a better developed banking system. Growth in the two countries has been driven by different sectors - Chinese growth by manufacturing and Indian growth by services. 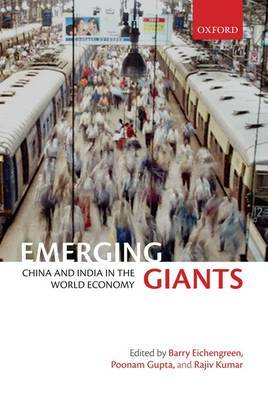 This volume brings together some of the best research on issues related to the growth experience of China and India and places these issues in a comparative perspective. It contains papers written by some of the leading academic and experts in the world on issues ranging from the roles of China and India in the world economy, contrasts in their development experience, and challenges to sustaining growth.